Previous Post What Have You Been Up to in the Last 4 Months? I do the same thing with sharpening – it’s not a process I enjoy, so I tend to put it off and then work against myself with dull tools! I’m working on getting myself onto a tool maintenance schedule. I haven’t figured out exactly how often I want to do this yet, but the idea is to take a day or part of a day and just spend it cleaning up, sharpening and making sure everything in the shop is running its best. Not the most fun, but it makes the rest of the time I’m in the shop much more enjoyable. I use Norton stones and that’s it. I don’t hollow grind. I have a 220 stone, a 1000, and an 8000. I flatten them usually once every few months with a flattening stone from Norton, though I probably should invest in a diamond stone. I use the original Veritas system. It’s nice because it can sharpen skewed blades. Everybody’s complaint about it is that it’s not easy to “lock” the blade down because the way it is held. That is true. But after using it for a year and sticking to if I’ve finally started to see some good results. Another nice thing about it is with just a twist of a knob you can add an instant micro bevel. I’m sure I can improve, and that would probably start with a new 1000 grit stone, as mine is starting to show wear. But I’m finally getting consistent results and I’ve been able to plane oak and ash and get nice shavings, which to me means sharp. At that, I’m much better with plane irons than with chisel blades. I use the Veritas system as well but not the micro bevel feature. No matter how tight, loose, straight or crooked I clamp in my blades, the micro bevel is skewed 90% of the time. I read online that I wasn’t the only one and there were mixed comments on whether user error or not but I just shift the blade manually if I want a micro bevel. I still love it and will keep for the skewed sharpening alone but I think I want to try out the sharpening jig that Lie-Nielsen has online. The Veritas system does have a learning curve. I’m of the mind that a plane iron can use a micro bevel, but chisels don’t need them. Like you said, I had micro bevels that got skewed on chisels with the Veritas system, but with plane irons I haven’t had any problems. In fact, I just did some sharpening last weekend and my planes are probably the sharpest they’ve ever been. As far as side clamping guides, for plane irons they work fine, for chisels they are horrible in my opinion. I would rather sharpen a chisel by hand than use a side clamp. Veritas also has the mark 2 guide which is supposed to be great, but I’ve never used it so I’m not all that sure. I was in the same boat, in that there always seemed to be some component of my sharpening routine that was throwing everything else off. A year ago I switched to the Paul Sellers system with diamond stones and can’t praise it highly enough. The coarse stone is key. It establishes your primary bevel and saves you from ever using your grinding wheel. No overheating, no struggling to set up a jig for a square and straight edge. For the finer grits you could probably stick with your ceramic stones. A convex bevel means you only hit the edge at one point in the stroke, so you just concentrate on that and not on maintaining flat, even contact and angle at all times.The green polishing compound fixes a lot of sins as well. I hate to sound like an evangelist but I sharpening is now a fun, organic component of my (limited) time in the shop, in stead of being a chore to get stressed about. I actually thought about at one point when I came across his method on a Lumberjocks video he posted. It seems to make sense but for the mean time as my methods are improving by correcting my errors, I’m gonna stick to what I have. Doesn’t mean I won’t try it in the future though. 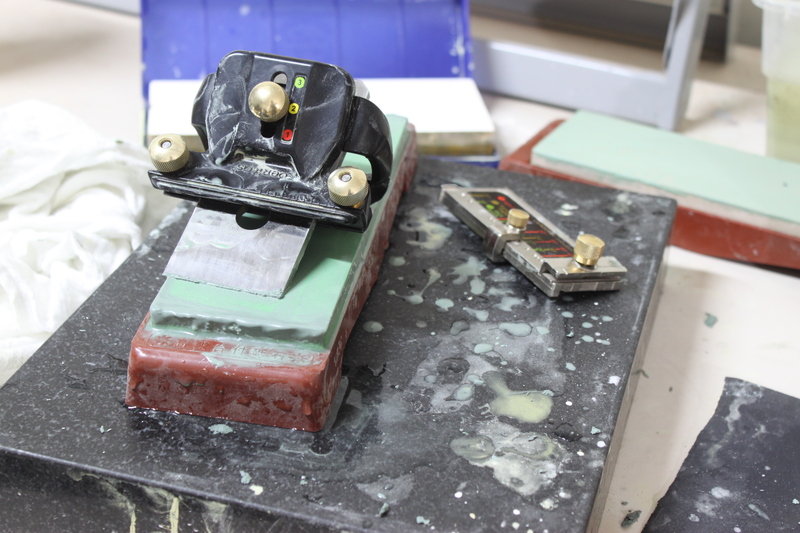 for flattening your stones you might want to consider a diamond atoma stone from Lee Valley. I personally use a 400 grit and love it, as it uses diamond groups instead of evenly distributed diamonds. This helps prevent sticktion when you get the stone really flat. I completely agree with you on getting an actual flattening stone. I was only expressing how I was able to correct my discrepancies utilizing what I had on hand. I thought about the norton flattening stone but as I want to upgrade to the shapton glass stones in the near future, I may just stick with what I have to save my pennies. I think I will give the diamond atoma stone a try. I hate sharpening and holds my whole work schedule up. I need to organise myself and spend a day on this .